Developed by Hänchen, H-CFRP® is a high load capacity composite made of carbon fiber and other components, refined to form a construction material. With this material, we design and produce components for hydraulic cylinders such as cylinder tubes, piston rods, and protection tubes without metal sliding surfaces. Hänchen produces lightweight carbon products using the so-called filament-winding method. Specially developed by Hänchen, this method makes it possible to design H-CFRP® components for mechanical engineering in small batches. 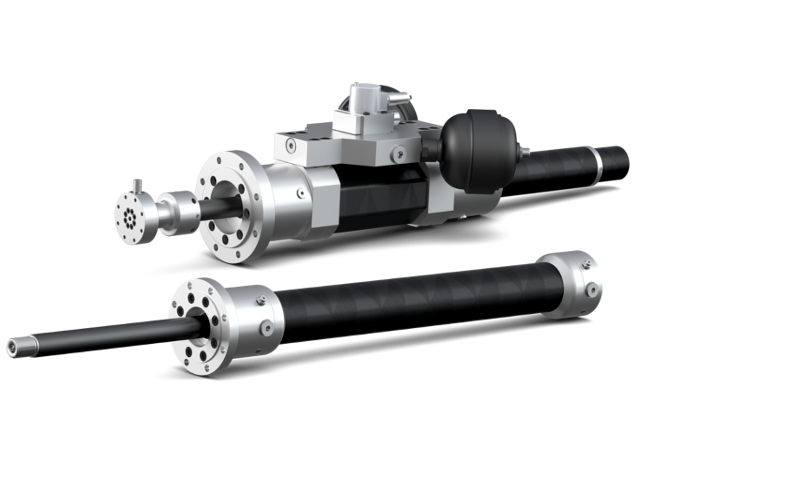 Hänchen produces lightweight hydraulic cylinders with H-CFRP® piston rods and cylinder tubes in small batches. In mobile and stationary lightweight construction, these reduce the weight by up to 80 %, and enable corrosion-free or non-magnetic designs. Carbon bars, rods and tubes made of H-CFRP® are designed and produced in small batches using the filament winding method. Continuous fibers sitting tightly and closely together are used to construct high load capacity round components, with pressure-resistant & liquid-tight H-CFRP® surface, with high-tensile bond between CFRP & metal.